As our planet warms, what life will survive and thrive? 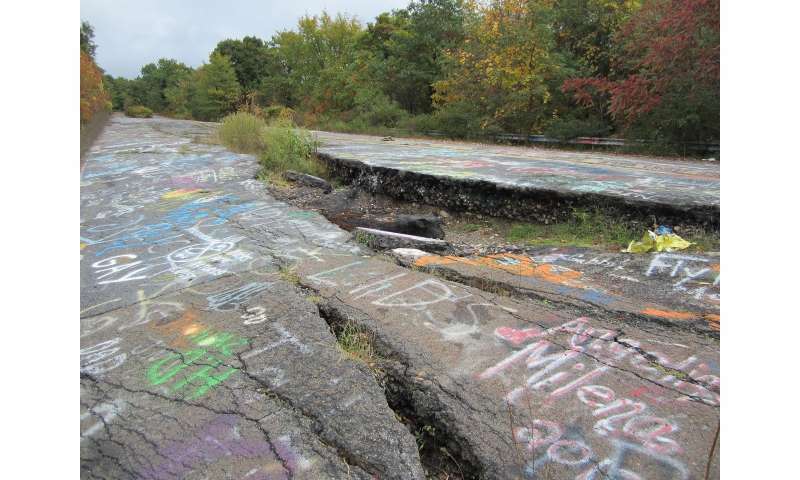 If the coal fire-fueled soils around Centralia, Pennsylvania, are any indication, organisms with smaller genomes and cells may do well in the future. The results of a new Michigan State University study, published in the current issue of Nature Microbiology, represent the first time such microbes have been found afield. The research clearly shows that, for soil microbiomes, hot temperatures result in both smaller genomes on average and also smaller cell sizes, said Ashley Shade, MSU microbial biologist, and the study's lead author. This isn't the case of simply one microbe embracing an economical approach, either; the majority of populations living in the steaming ground have these same traits. "This isn't an evolutionary study; we are seeing organisms that are competitive in the hot environment when they already have these traits," Shade said. "The populations living nearby in the cooler, ambient temperature zones are different than the organisms living in the thermal areas." In an interesting twist, the tiny organisms' genome sizes resemble those found in a completely different region of the world—those found in Arctic permafrost. "In a comparison with other soils, we found that the average genome sizes in hot soils were most similar to those in ancient permafrost," said Shade, regarding her National Science Foundation-funded research. "Our working hypothesis is that these thermo-tolerant cells were not undergoing active genome reduction, but instead had never experienced substantial genome expansion because they are less derived from an ancestral state." Soil is one of the world's most-complex, most-diverse habitats. A single teaspoon may hold millions of microbes—active and dormant. In fact, it's the dormant microbes that have attracted the attention of the research team, as they appear to be the leading potential source of these thermophile organisms in Pennsylvania. The Centralia coal fire has been burning since 1962. Ignition of the large, underground coal seams has devastated area communities but created an unworldly laboratory, replete with abandoned roads, decrepit structures and steaming vents that reek of rotten eggs. For Shade's research, she focused on microbes living across a temperature gradient, spanning from normal to thermal. The thermophile microbes Shade's team discovered don't appear to have evolved from their ambient-temperature-loving neighbors. Also, it doesn't appear that they were dropped in from an outside source, like through the wind. That leaves dormant microbes, ones simply biding their time for the optimal conditions to animate, as the prime culprit to their origin. "Centralia is a field environment in which we can observe organisms getting hit with a sledgehammer," Shade said. "Traveling there allows us to probe extreme conditions—ones that caused a turnover in the entire community toward small genomes. The gradient happens in the same environment, in the same soils." The scenario leaves the researchers wondering, what's the minimum requirement for cell and genome? What other dormant microbes in soil, water or our gut are awaiting to be awakened and identified? For the next steps of this research, Shade's team will dive deeper into the source of these microbes. The researchers also will examine the populations living on the gradient more closely, identifying areas of overlap and seeing where and how the different populations transition and compete as the fire heats up. Is Mars' soil too dry to sustain life?